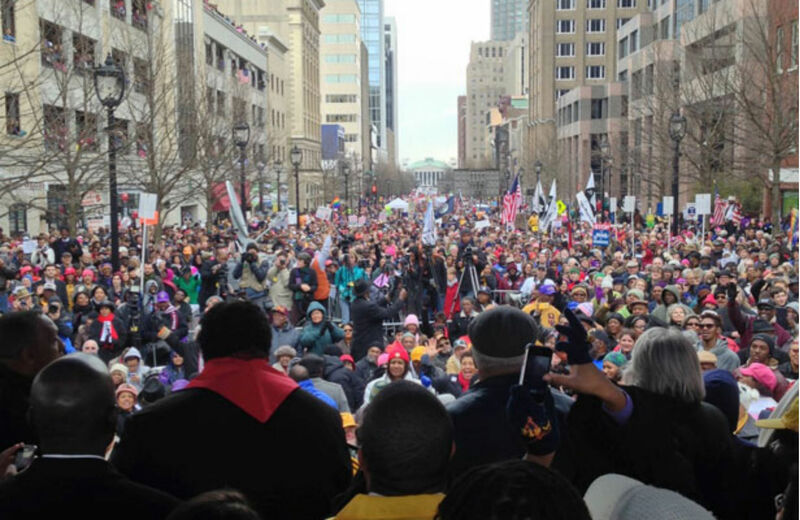 Last February, tens of thousands of activists with the Moral Monday movement marched to the North Carolina capitol to protest the right-wing takeover of state government. It was the largest civil rights rally in the South since the Selma to Montgomery march in 1965. This Saturday, there will be another large “Moral March on Raleigh” to kick off a new year of activism and protests—on the birthday of Frederick Douglas, three weeks before the fiftieth anniversary of “Bloody Sunday” in Selma. Moral Monday activist have fought the legislature’s policies in the streets, in the courts and at the ballot box over the past two years. Over 1,000 people have been arrested during demonstrations at the legislature. The North Carolina NAACP has held 200 events in fifty-four counties. Young activists registered 5,000 new voters during the “Freedom Summer 2014” campaign. Moral Monday spinoffs have begun in many other states. North Carolina Speaker of the House Thom Tillis, who spearheaded the legislature’s right-wing agenda, narrowly defeated Democrat Kay Hagan in the country’s closest Senate race. Tillis has been widely mocked in recent days for suggesting that Starbucks employees shouldn’t have to wash their hands after using the bathroom. A preliminary injunction against key provisions of the voting law—ending same-day registration, cutting early voting and prohibiting the counting of ballots cast in the wrong precinct—was denied by a US District Court and the Supreme Court. The new restrictions made it harder for thousands of voters to cast a ballot. There will be a trial on the full merits of the law in July 2015. North Carolina’s Republican-passed redistricting maps, which resegregated the state politically, were upheld in December by the North Carolina Supreme Court. Partially as a consequence of legislative gerrymandering, Republicans retained large majorities in the legislature after 2014. The Moral Monday movement will need to deepen and refine its organizing capacity in 2015 if it wants to have greater success in 2016, when Governor Pat McCrory is up for re-election, and North Carolina is sure to be a pivotal battleground state. Barber calls 2015 “a new year of complete and continuous activism.” He says the North Carolina NAACP will focus on challenging the voting restrictions in court, double down on the need to expand Medicaid, push for a ballot initiative in 2016 to raise the minimum wage, and build local networks in targeted state legislative districts. In the week leading up to the Moral March, activists are holding daily demonstrations at the legislature, which include fast-food workers mobilizing for a higher minimum wage and healthcare advocates holding a “die-in” to protest the rejection of Medicaid expansion. “We must march, mobilize, litigate, agitate, legislate, and continue to be focused on these state capitols,” Barber says.